I was inspired to make shrimp today, and since I have never cooked shrimp myself, I decided to stick with the flavors I’ve been working with lately and try to make another version of the chicken I last posted. This time it was better. No Far East quinoa here, but real organic quinoa with my own herbs added. I did not post the chicken recipe, but I’ll go ahead and do the best I can with sharing this recipe. I guess this is considered a salad of sorts? Whatever, it’s good and mostly healthy, and that’s all that matters. I bought frozen raw shrimp with shell and tail intact and pulled out about 20 of them from the bag to thaw. I put them in plastic ziplocks and placed in a bowl of cold water for like…. the whole day. Mix these two together, I have no idea how much of each. Maybe 1/2 cup each. Sure. -Add a ton of pepper. I like to count turns on my pepper grinder. I did 30 turns for my age. Yup, this is how I cook. 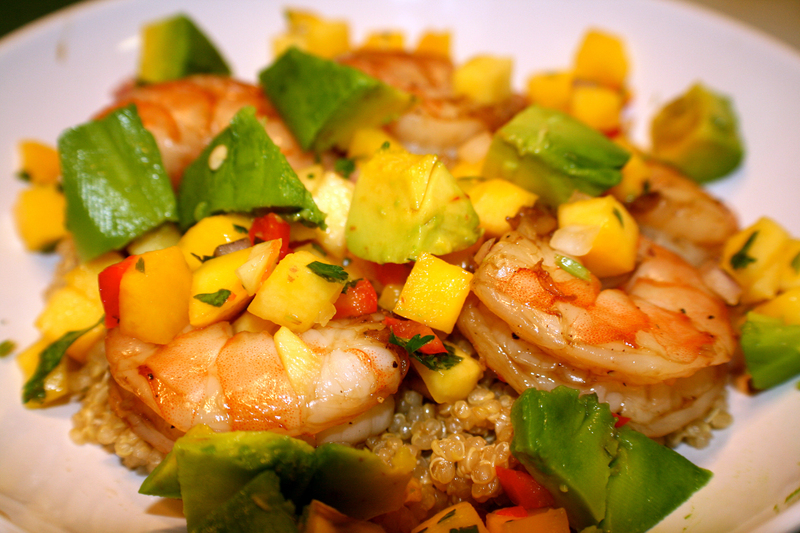 Once shrimp is thawed, get rid of all the water in the bowl, empty the shrimpies into the bowl and rinse them. Add the marinade. Mix it all up and do weird things like add minced garlic and more pepper as you mix it up. I actually added the red bell pepper like a few minutes before it was finished, only because I completely forgot to add it… but it worked out because it kept it kind of crispy and fresh. I added a bit of the leftover marinade from the shrimp to this once cooked for some extra flavor. Lay the shrimpies out onto a cookie sheet and bake/broil at 400 degrees for 8 minutes (I hear Barefoot Contessa says 8 minutes). Once they are cooked, pull them out of the oven and peel them and if you want to, like I wanted to, you can add some leftover marinade to them. My grocery store makes this fresh, thank goodness, because ain’t nobody got time for that! It has mango, onion, red bell pepper, cilantro, and I think that’s it. Add quinoa to a bowl. Put shrimp on top. Cut some avocado up and add that too, just because avocado is delicious. And because I like saucy things, I drizzled it with even more leftover marinade! Iced green tea is best with this meal. Yummmm. This entry was posted on February 16, 2013. It was filed under Cooking.